Magipics has produced a scientific animation in the field of astrophysics for the ARC Centre for All-Sky Astrophysics (CAASTRO). This animation describes new discoveries concerning the supernova remnant of a star that exploded in the Large Magellanic Cloud in 1987. This was so far the closest and brightest supernova seen from Earth. Astrophysicists have been studying the supernova remnant SNR 1987a using the Murchison Widefield Array in Western Australia. The remote location of this radiotelescope in the Australian outback means the site is free from FM radio interference. Astronomers are thus able to explore the universe at the lowest ever radio frequencies, and get a better understanding of stellar explosions. In the case of Supernova remnant 1987a, the researchers have been able to probe the supernova’s past life millions of years further back than was previously possible. 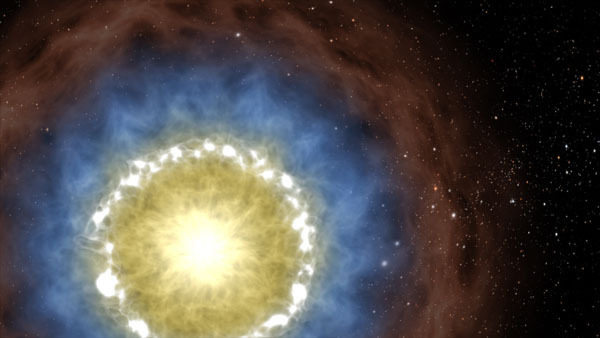 Up until now only the final blue supergiant stage of the exploding star had been observable. However, these latest discoveries shed light on the star’s earlier longer-lasting red supergiant phase. The project was led by Joseph Callingham, a CAASTRO PhD candidate at the University of Sydney, under supervision from former Young Australian of the Year and former CAASTRO Director Bryan Gaensler, now at the University of Toronto. A challenge when creating the animation was to design a realistic representation of star surfaces, and a plausible dynamic visual representation of the multi-layered clouds being emitted into space from the supernova and interacting with each other. The notion of being able to delve further back in time to the earlier red supergiant phase of the star was symbolized by a “video rewind” effect. Hope you find the animation interesting!